DIGNITY IS CENTRAL TO SOCIAL LIFE Social life is organized largely around the according and preserving of dignity. Even small and inadvertent slights to dignity can incite intense responses, some open and direct, some subtle and disguised. Violence is an affront to dignity. Even in the most extreme conditions, victims work to retain and reassert their basic human dignity. VIOLENT ACTS ARE UNILATERAL AND SOCIAL Violence is unilateral – not mutual – in that it entails actions by one person against the will and well-being of another. When it comes to violence, it does not “take two to tango”. Violence is social in that it is committed in social situations and involves at least two people. The smallest and most subtle actions can be used to threaten and humiliate or to resist and maintain safety and dignity. VIOLENCE IS DELIBERATE Persons who commit violence anticipate, and take deliberate steps to suppress, victims’ resistance. Even so-called “explosive” or “out of control” acts of violence involve control and choice. HUMANS ARE RESPONSIVE AND ACTIVE Humans orient to one another as spirited and embodied beings with the capacity to respond. It is more useful to understand humans as responding agents than as affected objects. Resistance is a response to violence, not an effect or impact of violence. SOCIAL RESPONSES ARE CRUCIAL The quality of social responses from social networks and public institutions is closely tied to the level of victim distress and the likelihood the offender will desist. Our collective goal is to improve the quality of social responses at all points of intervention in violence and other forms of social injustice. Dr Allan Wade from Canada, left, was one of the expert speakers at the international Dignity Conference 2015. 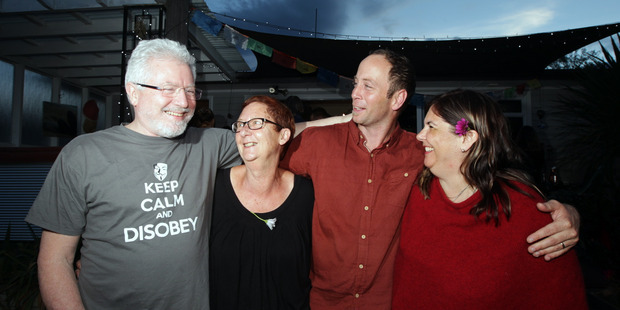 A huge thanks to everyone for making Dignity2015 such a success…!! Hosted by: Te Ūranga Waka: School of Maori Studies, Eastern Institute of Technology & Response-Based Practice Aotearoa. In association with Centre for Response-Based Practice. Canadian Team: Dr Allan Wade, Dr Cathy Richardson, Renee Claude-Carrier, Barb McInerney, Jeff Smith, Will Bratt, Dr Brenda Adams, Cindy Ogden, Gillian Weaver-Dunlop, Corporal Kelly Manweiller. Australian Team: Angela Hartwig, Ian Johnsen & Christine Adams. New Zealand Team: Dr Kim McGregor & Louise Nicholas, Dr Ang Jury, Karen McIntyre, Tame Iti, Dr Leland Ruwhiu; Ngā Toka Mā E Whā & Te Whare Whakaū, Moana Eruera; Eru Kapa-Kingi, Rahuikura Eruera, Laurie Te Nahu, Sue Maloney, Dr Mandy Morgan, Dr Linda Beckett, Julie Hart. Director: Bren Balcombe Response-Based Practice Aotearoa Limited was Incorporated in January 2015 has been solely set up for the purposes of providing Response-Based Training, Education, and Professional Development in Aotearoa New Zealand. The RBPA Committee team works primarily on a voluntary basis. Neither RBPA Ltd nor the committee team claim to be Response-Based Practice experts, scholars, nor do we claim to have contributed to the development of Response-Based Practice. Allan Wade and his colleagues are the developers and intellectual owners of Response-Based Practice. We are however, heavily invested in developing our skills in Response-Based Practice and providing support to the professional community to do the same.